chameleon vents are custom designed to integrate hard-surface flooring material with a metal register frame. synthesis of function and style. the revolutionary design of the chameleon vent is the solution to an often overlooked, décor dilemma. designers and design savvy consumers agree, chameleon vents are a visible sign of good taste. no residential design or renovation project incorporating ceramic tile or stone flooring should be complete without a chameleon vent. chameleon vents for the complete floor – chameleon vents for the sophisticated floor. chameleon vents blend in, yet stand out as a true hand-crafted design. 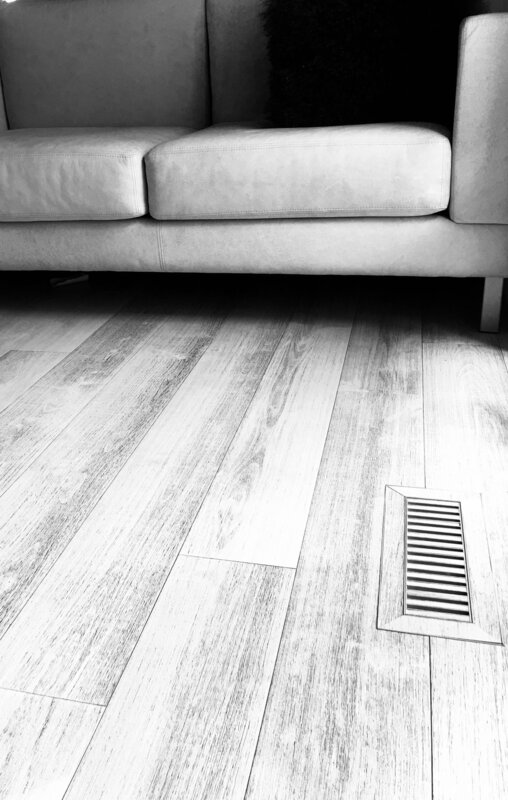 chameleon vents are the perfect finishing touch for your floor. chameleon vents are customizable floor registers that will greatly enhance the appearance of your ceramic tile, slate, marble or granite floor. to standard metal floor vents. just insert installer cut pieces of the surrounding floor material into the channels of the chameleon vent. high-strength and versatile finish to your new floor. finally, with chameleon vents, you can create matching registers for ceramic tile and stone floors. chameleon vents not only unified the floor, but elevated the area into a showpiece. We started offering chameleon vents after we saw one quite by accident and thought they were the most suitable solution for any tile and hardwood floor vent application. Our customers appreciate the fact we take the time to provide them with a superior alternative giving them decades of elegant and lasting service from chameleon vents. A quality floor demands a chameleon. Carole Riendeau, Propriétaire, Carole Riendeau Design Inc.
We are very pleased with this product! Although…they are more complex to install, the results are by far superior in terms of style and sophistication. Just wanted to fire you an email saying that the vents look fantastic. Great product. Just thought I'd let you know that the vents have been installed in my house and they're a huge "wow" factor. Everyone who sees them is impressed. I've passed on your brochures to the contractor. use a chameleon vent as an alternative to standard décor grates, heat registers, heat vents, metal floor vents, floor registers, floor grates, floor grilles, air vents or wood registers. for a flush mount vent you can use ceramic tile, slate tile, marble tile, stone tile, porcelain tile, vinyl tile. they can also be used for exotic wood species and concrete floors. 2¼" x 10" 2¼" x 12" 2¼" x 14"
3" x 10" 4" x 10" 4" x 12" 4" x 14"
6" x 10" 6" x 12" 6" x 14"